Obstructive Sleep Apnoea: Ever wake up feeling you never slept? Do you find yourself dozing off during the day or while driving? Does your partner complain that you snore very loudly or even seem like choking during sleep? If you are male, overweight, middle aged and have a thick neck circumference, chances are that you may have sleep apnoea. Sleep apnoea is a condition where the soft tissues in your neck gets so relaxed during sleep that it blocks the airway and causes you to wake up momentarily many times during the night. Thus you never get into deep sleep and wake up feeling that you haven't slept well. This condition is quite common and affects around 30% of the adult population in Singapore. Obstructive sleep apnoea (OSA) can affect your health as well. Approximately 50% of those suffering from sleep apnoea have high blood pressure and OSA may be a risk factor for heart attacks. If you suspect you have sleep apnoea, do drop by the clinic. We can do a simple test to see if you have this condition and help you get a good night's sleep! 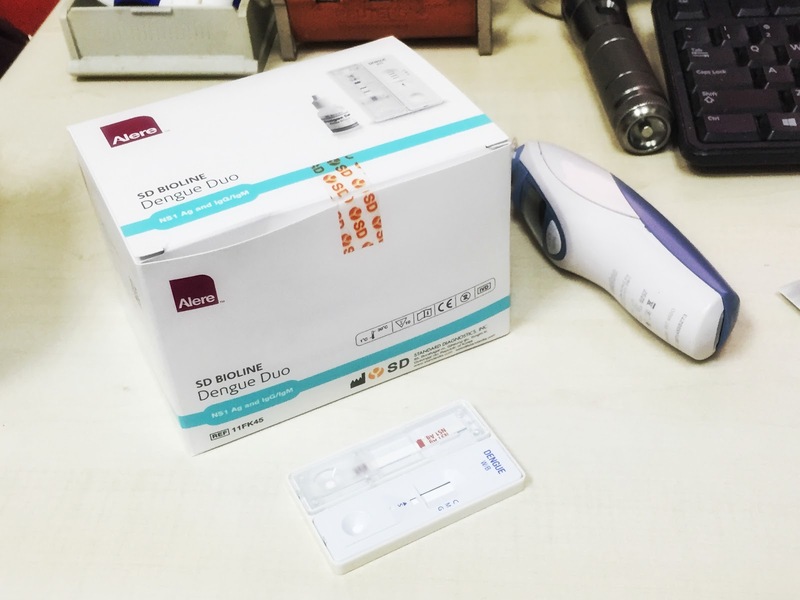 The Dengue test kit is now available at our clinic. With this kit, we will be able to test for dengue using only three drops of blood and the results will be known within 20 mins! The test can be done as early as the first day of fever, but will be more reliable after day 4 of fever. Please remember to get your children vaccinated against measles. There has been a surge in measles cases in Singapore. The first jab is usually given at 12 months and the second at 15-18 months. You may have kids who have taken the first jab but not the 2nd. Please bring them in for the booster jab as soon as possible. Its Hazy outside! Stay indoors! "The health impact of haze is dependent on one’s health status, the PSI level, and the length and intensity of outdoor activity. Reducing outdoor activities and physical exertion can help limit the ill effects from haze exposure. Given the air quality forecast for the next 24 hours, healthy persons should avoid prolonged or strenuous outdoor physical exertion. The elderly, pregnant women and children should minimise outdoor activity, while those with chronic lung or heart disease should avoid outdoor activity. Persons who are not feeling well, especially the elderly and children, and those with chronic heart or lung conditions, should seek medical attention." In addition, if you have asthma or sensitive airways, please use your inhaler if you are feeling short of breath. If that doesn't relieve the symptoms, please seek medical attention. The latest report by British Journal of Sports Medicine shows that elderly men who exercise 30 mins a day, six days a week will reduce their chance of death over a 12 year period by 40%! And it doesn't matter if the exercise is light or vigorous! So get your daily dose of exercise and live longer! Karri Family Clinic Now Accepts CHAS and Pioneer Generation Cards! I am very happy to announce that Karri Family Clinic is now a CHAS clinic and we can see patients who are holding either the Pioneer Generation card or the HealthAssist cards! If you hold such a card, all you need to do is to fill up a simple form the first time you visit our clinic to register yourself at our clinic. You can then start using your HealthAssist or Pioneer Generation cards. Pioneer Generation card holders will get $28.50 deducted from your bill. So, if your consultation and medications come up to $50, you pay only $21.50. For Blue Tier card holders, if your bill is $50, $18.50 will be deducted from your bill and you pay $31.50. Different rates apply for chronic diseases. Please refer to the chart below or check the CHAS website for more details. We look forward to serving you at Karri Family Clinic! When I was young boy, my mum used to always cook an egg for me for breakfast. For those of us who grew up in the 70's and before, the egg was good, healthy food and I often remember people in those days bringing eggs to the Char Kway Teow or Roti Prata man to have them add it into their dish to enhance it. In between then and now, the egg became a sort of poster boy for high cholesterol food. So much so that people started to cut down on eggs. I am sure you know of people who would eat the egg white and leave the egg yolk behind. The message that eggs were high in cholesterol and would thus lead to high blood cholesterol was so well marketed that it became entrenched in everyone's mind. In recent years, the thinking about eggs has changed. Not only have egg producers managed to lower the cholesterol content of eggs, but there have been studies that show that there is no link between eating eggs and high cholesterol levels. In these studies, people who were given two eggs to eat daily showed no significant increase in cholesterol levels compared to those who didn't eat eggs. As a result of this new information, the heart foundation are now telling us that eggs are nutritious and a healthy part of a balanced diet. I often have to counsel parents with kids who are finicky eaters. You know, those who are slightly underweight and don't eat very well. My advise is always to give these kids an egg for breakfast in the morning. Eggs are packed full of goodness and they are a good source of healthy protein for growing kids. Unlike adults, kids actually need cholesterol because they are the building blocks for growth. And, it's certainly healthier for your child to eat a soft boiled egg for breakfast than having those sweetened cereals and fruit juices which have so much added sugar! Now before you go out and binge on eggs, let me just remind you that eating an hard boiled egg is good but eating an egg fried in butter is not as the butter is high in saturated fats. Same goes for eating that extra slice of cake. There are eggs in cake but there is also (most of the time) saturated fats like butter which is not good for your cholesterol levels. Same goes for that bowl of ramen. It might be ok to eat that egg, but the ramen soup is full of pork lard which is high in saturated fats! So please, what I am saying about eggs refer to just the egg alone! You still need to take note of how it is prepared! One last word on eggs. When you buy your next tray of eggs, do take note of the nutritional information on each tray. Nowadays, egg farmers are feeding their chickens which different feeds which can really lower the cholesterol levels of eggs and increase Omega 3 fatty acids. So if you are still concerned about cholesterol levels (especially those with heart conditions) you can actually buy eggs which are lower in cholesterol! At the end of the day, always remember that the bottom line to a healthy diet is balance. A diet that is higher in fruits and vegetables and less in meats, fats and sugar is a good balanced diet and the egg can be a nutritious and inexpensive part of that diet. Singapore has just reported it's first dengue fatality this year. Here is a timely reminder for everyone to be more vigilant about keeping your place mosquito free and to see your doctor if you have a fever. This is another reminder for everyone who lives around Blk 869 especially in the lower levels. We have several patients who have tested positive for dengue and one of our patients reported that a neighbour of hers in the block has passed away from dengue. So please take the necessary precautions and seek medical attention if you develop a fever. One of our patients living in block 867 has just been confirmed to have Dengue fever. We would like to remind all our patients to take extra precaution. The dengue mosquito likes to bite 2 hours after sunrise and at dusk and they like to bite indoors. So do take the necessary measures to protect yourself and your family. If you have a high fever and severe bodyache, please seek medical advise. We are now able to do a blood test that can detect Dengue from the first day of the fever if necessary. Rash appearing after the fever subsides usually after the 5th day. The rash may look like a measles types rash. There may also be some pin point red spots known as petechiae that may appear. Sometimes the Dengue Fever causes the platelet levels (component of the blood responsible for clotting) to drop dramatically. When the platelet levels are low, the body loses its ability to repair any bleeding blood vessels. This might result in uncontrolled bleeding in the body which is the condition known as Dengue Haemorrhagic Fever. (Haemarrhage means to bleed) Dengue Haemorrhagic Fever is the main cause of death when the patient contracts Dengue. What happens when you are diagnosed with Dengue? If you have a fever for 5 days and the blood test reveal that your platelets have dropped to less than 150.000 you will need to do daily blood tests to monitor your platelet levels. Most patients will not need admission. Dengue can be managed at home with daily visits to the clinic. What you should do when you are diagnosed with Dengue. There are no antibiotics that can be given with Dengue. It is mainly bed rest and fluids until the patient recovers. If the platelets are low, you should avoid any vigorous exercise or situations that may cause an injury. Although you cannot infect another person directly, it is possible that a mosquito that bites you can in turn bite another person and transmit the disease that way. So it is important to make sure you do not give mosquitos a chance to bite you. Dengue can be a deadly disease. It is important to recognize the symptoms of Dengue so that you can present yourself for a blood test. The most important way to to avoid contracting Dengue is to ensure that you don't get bitten by mosquitoes by taking the usual precautions. MOH recommends that girls aged 9 to 26 be vaccinated against the HPV virus infection which has been linked to the development of cervical cancer later in life. So do get yourself and your loved ones vaccinated as soon as possible. You can now pay for the vaccines through Medisave. Please check at the clinic for further details. The vaccination is taken at 0, 1 and 6 months. ECHO: Register for your Health Screening now! Tampines ECHO Video from CGH CA on Vimeo. For those of you who have not had Health Screening done before, now you can do it for as low as $2 as part of the Eastern Community Health Outreach initiative. Its time to do some maintenance work! For those who want a more comprehensive package, we also offer packages starting from $60 at our clinic. Do come by the clinic and have a chat with our doctor who can cater a package to your needs. Hep A outbreak in Malaysia: Protect yourself with the Hep A vaccine! There has recently been a report of an outbreak of Hep A in Terengganu, Malaysia. If you are planning a trip to the region, please get yourself vaccinated with the Hep A vaccine. You will need two jabs over six months, but even after the first jab, you will get 85% protection by 2 weeks and 100% protection by 3 weeks. Hep A is easily contracted through exposure to contaminated food and water and is highly recommended for visitors planning to travel to regions like South East Asia and South Asia. The Hep A vaccine is available at our clinic at $110 nett.